This movie sequence of images was captured by a star tracker camera on NASA's Jupiter-bound Juno spacecraft. It was taken over several days as Juno approached Earth for a close flyby that would send the spacecraft onward to the giant planet. Although grainy and over-exposed, the images provide a nonetheless remarkable and uncommon view from a human-made craft approaching our world from deep space. The images that make up this movie sequence were acquired by one of the four cameras that comprise Juno's Advanced Stellar Compass, or ASC -- a key component of the Juno magnetometer experiment. The ASC cameras provide images of the stars that reveal precisely the spacecraft's orientation in space, which will be vital for determining the strength and direction of Jupiter's magnetic field once Juno arrives there in 2016. As star trackers, the cameras were not designed for imaging the planets. This sequence exists because of their serendipitous placement on the spacecraft -- situated on Juno's magnetometer boom, at the end of one of the craft's large solar arrays. The cameras happened to be pointed in Juno's direction of motion during the flyby, allowing this movie sequence to be obtained. The movie begins at 2:00 UTC on Oct. 6, more than four days before Juno's closest approach, when the spacecraft was approximately 2.1 million miles (3.3 million kilometers) from Earth. 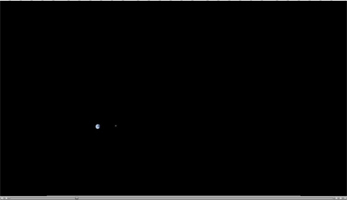 Earth's moon is seen transiting in front of our planet, and then moves out of frame toward the right as Juno enters the space inside the orbit of our natural satellite. As Juno gets closer to Earth, hints of clouds and continents are visible before the planet's brightness overwhelms the cameras, which were not designed to image so bright an object. The sequence ends as Earth passes out of view, which corresponds to approximately 17:35 UTC Oct. 9 when Juno was at an altitude of about 47,000 miles (76,000 kilometers) above Earth's surface. The sequence is replayed in the second half of this movie at two times and eight times magnification. As Juno is a spinning spacecraft, the images were aligned to remove their apparent rotation. The original ASC images are monochrome; faint coloration has been added by converting the measured grayscale values into false colors matching a true color image of Earth. Music Courtesy: Vangelis (used with permission). NASA's Jet Propulsion Laboratory, Pasadena, Calif., manages the Juno mission for the principal investigator, Scott Bolton, of Southwest Research Institute in San Antonio. The Juno mission is part of the New Frontiers Program managed at NASA's Marshall Space Flight Center in Huntsville, Ala. Lockheed Martin Space Systems, Denver, built the spacecraft. JPL is a division of the California Institute of Technology in Pasadena. The Advanced Stellar Compass was provided by the Danish Technical University in Lyngby, Denmark.